Don't forget to enter my giveaway. Please press giveaway to be linked to this giveaway on my website or click on the Le Crueset dishes at the top left of my blog. When we were young living in Wisconsin, our family lived in a row of houses in the country. 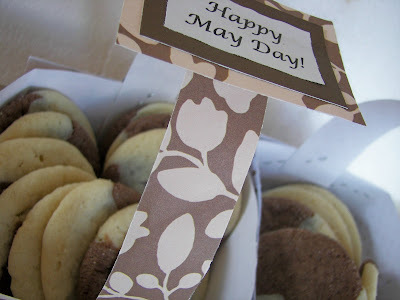 On May Day, May 1st, we would bake cookies and place them in homemade construction paper baskets. We would take these goodies to our neighbor's home and ring the door and hide or run. Since we were the only kids in the row of houses, I am sure our neighbors knew who brought them. When I had my own family, I thought I would continue this tradition...but no! My first child, a son, was born on May 1st. Since then May 1st has been a busy day here and we have never given out May Baskets...UNTIL THIS YEAR! My son turns 16 tomorrow, so after 16 years, I have finally decided it is time to do May Baskets for my neighbors. We won't doorbell ditch; times have changed... Also check back to see what we delivered to my son at school today for his "Sweet 16!" After so many years, I forgot how to make paper baskets. I turned to the trusty internet to get instructions here. I didn't make them exactly as indicated. I cut my paper to 8x8. You could even make them smaller. I used scrapbook paper that I had in my supplies. I used staples, but a good paper glue would probably be better. When I was young, I think we made woven paper baskets. Every week eight sweet girls from my church (age 8 to 11) to do activities We are making these same baskets for a cute Mother's Day gift. These baskets are so simple and fun and I think they will have fun making them for their mothers. 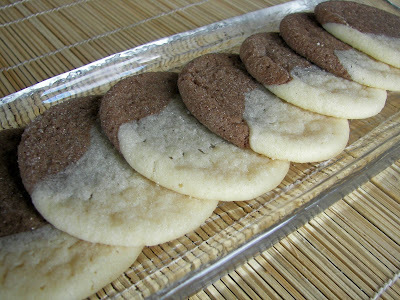 I developed this recipe after trying a recipe that was made from a sugar cookie mix; it didn't turn out well so I made this recipe; that is what I get for using a mix! 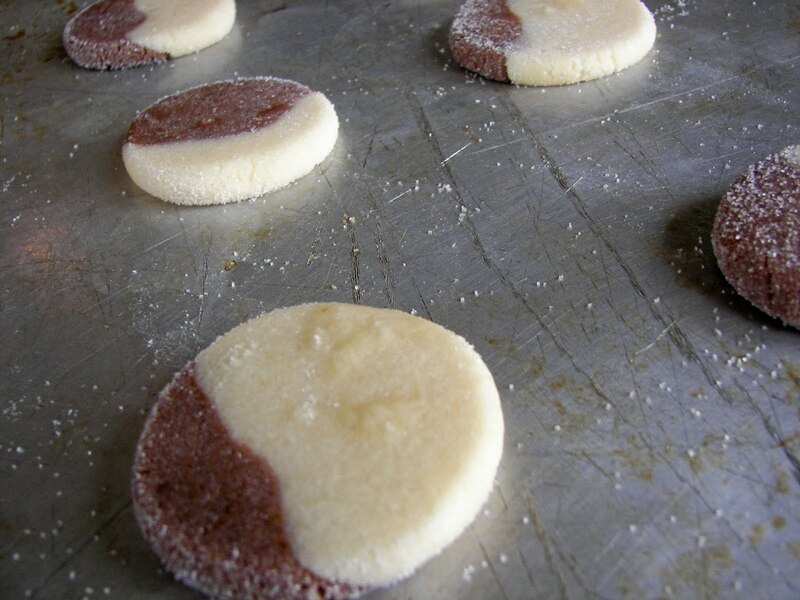 You could also call these Yin Yang cookies. By the way, they are delicious and they store really well. 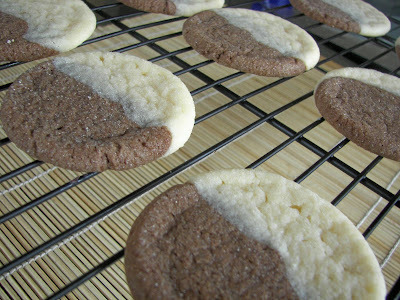 I love the chocolate and almond flavoring in these cookies. 2-1/3 cups all-purpose flour, plus 1 tablespoon to add to chocolate dough. 1/3 cup chocolate chips -- I used milk chocolate. Put butter and sugar in medium mixing bowl and cream until light and fluffy. Add egg and almond extract and beat until incorporated. Then add baking soda and flour little by little. Divide dough in half. Melt chocolate chips in microwave being very careful that they don't burn. 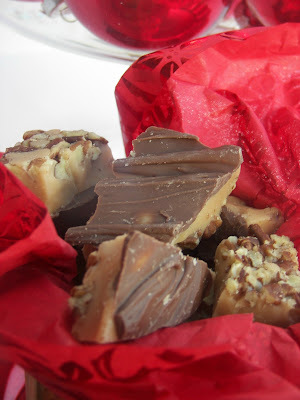 Cool chocolate and add melted chocolate and cocoa powder to one half of the dough and mix until chocolates are incorporated. If the chocolate dough doesn't seem stiff enough, add 1 tablespoon of flour. 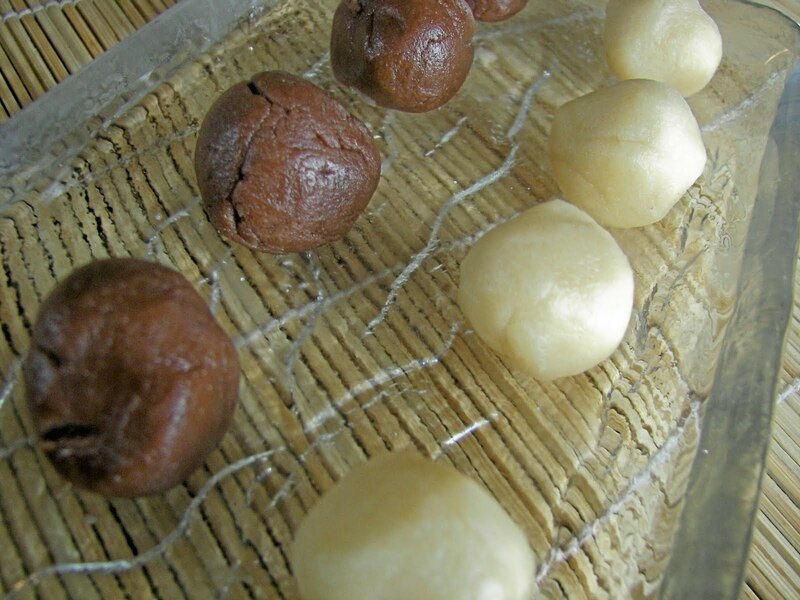 Take white dough and, using a little less than 2 teaspoons of dough, roll into small balls. 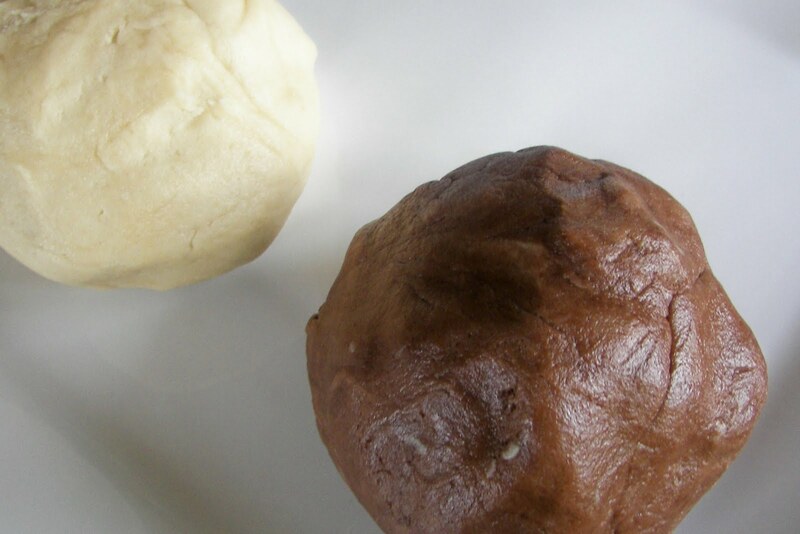 Take chocolate dough and so the same. 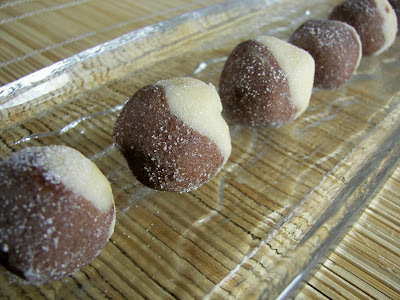 Roll the white and chocolate dough together and roll into sugar. Place chocolate/white cookie ball on baking sheet. Press glass on cookie and smash until about 1/4 inch thick. Bake in 350 degree oven for 8 to 10 minutes; do not overbake. This cookie recipe makes about 44 cookies. Those cookies look fantastic! I never heard of a May day celebration until yesterday. I wonder is it a midwest celebration or all over? I love it so neat! What a fun tradition. Your basket and cookies look divine and would be so such a fun surprise at my house. Thanks for sharing! I always did May baskets as a kid and now I do it with my children (though we may be the only ones in town who do it!) Along with little baskets for the kids' friends, we do some bigger baskets of goodies for adults we want to give a special thanks too. This cookies look like a great addition! these look delicious. and i love the idea of dropping cookies off to the moms. i think we'll have to do that next weekend. I did May baskets with flowers as a child. As I got older I always sent my mom flowers on May Day. After she moved and a May basket became so expensive, I'd send a card covered with flowers. I love it that you are bringing back the tradition. The cookies look yummy! Sounds like a fun celebration...something my girls would love! The cookies look so delicious!! So pretty! I'll have to give these a try. What a wonderful tradition! I love taking goodies around to my neighbors. I am known as the "Salsa Fairy" in my neighborhood, because I give away salsa every August when my tomato plants are going nuts. I have so much fun doing this! Maybe next May 1 I'll start your May Day tradition. This is just another one of your ongoing attempts to sabotage my hips! 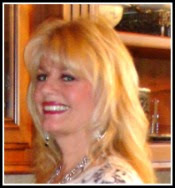 Shaunna mentioned it was May 1st today and I thought of Mom and May Day. I tried it when the kids were young and people didn't know what it was about. Today I walked in and a neighbor had brought me a May Day mini pansy in a tiny clay pot with a little note about May Day. Right away I thought I knew who it was and called her. I told her she made my day that I had been thinking about May Day traditions today. For the cutest paper shoe pattern go to www.skiptomylou.org/2008/10/28/paper-witch-shoes. Your basket was way cute. Thanks for stopping by my site for Alphabee-Thursday. . . Yes we are from Wisconsin. We used to be near Madison, now we are a bit further away. Joni, the cookies are beautiful and they look delicious! Like the May basket too!